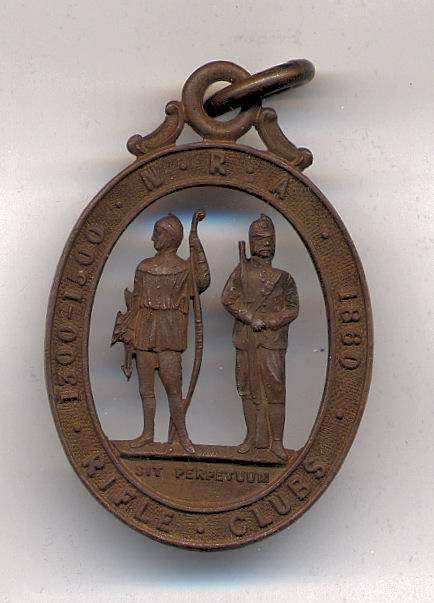 Oval bronze medal (a) with an outer band enclosing the emblem of the National Rifle Association - two figures, one holding a bow and arrow, the other a rifle - with the motto SIT PERPETUUM below. 1300 1500 NRA 1860 RIFLE CLUBS round outer band. The medal has a ring at the top which fits over a hook in the presentation box (b), which is covered in dark blue paper. The base of the box is lined with blue velvet and the lid with blue silk stamped with a gold crown and VR BY APPOINTMENT ELKINGTON & CO.
Hello we have an identical medal as described above. It was left to us by my late grand mother who served as a military driver during WW2. We are interested as to why this medal was presented, and its value . Thank you for your comment. this medal would have been presented for by the National Rifle Association for a shooting competition. You can read more about the NRA and it's history at https://nra.org.uk/nra-bisley/museum/. As far as value goes I am not entirely sure but I notice that there is one for sale on Ebay for £8.00 ~ Administrator.